This event will last approximately 2 hours and 30 minutes. Tony and Obie Award-winning writer and composer Stew delves into the rich legacy of activist writer James Baldwin in this new music and theater experience alongside long-time collaborator and co-composer Heidi Rodewald and an all-star band. 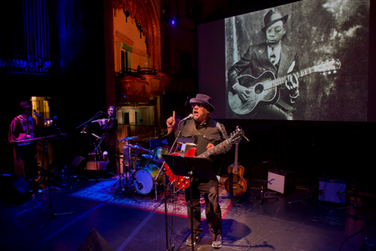 Stew’s uniquely incisive lyrics are wrapped in an irresistible mix of rock, rhythm and blues, and jazz in this powerful homage to the inspiring writer, who famously confronted issues of gender, race, and class distinction with wisdom and fire.